Most of the children I know don’t need more things. Most children I know could benefit from more uninterrupted hands-on experiences with adults. This year, I want to focus on non tech gifts we can do with our children to bring more calm energy into our children’s homes and hearts. Potholder loom – This potholder loom is a childhood classic and wonderfully simple, allowing you to enjoy this activity with your child at home, on road trips, and at family gatherings. The soft pieces of fabric come in fantastic bold colors to allow individual creativity to be expressed in their weaving. Hand-weaving has a traditional history and adds value as a way to include education in your child’s gift. Plump Flump Beginner Knitting Kit – Do you know a child who has restless hands? Knitting is a great way to keep hands occupied with the enjoyment of seeing the results of your work as you go. Enjoy learning a new skill with your children with this perfect beginner’s kit, everything you need is included in the gift to get started. This product is artisan-made and supports a small business owner. Growing Crystals – If you have a curious child, these growing crystals are a perfect way to get them involved with a hands-on science experiment. This kit includes a fun display case for them to keep their crystal creations in and contains enough solution to create 7 crystals in all. This gift is best for children 10 and older and does require some adult supervision. Indigo Tie Dye Kit – Enjoy this natural dyeing kit with your children and see what wearable art you can create together. The kit includes gloves, rubber bands, dye, and instructions to get started. Teach your children the beauty of unpredictability by not knowing exactly how your creations will turn out. This kit is able to dye up to 15 shirts or 5 pounds of clothing. Pop up Paper house – A beautiful idea that is economical, space-saving, and engaging from start to finish. Allow your child to make their own pop up paper doll house with easy to follow guides and eight rooms of playtime fun. This wonderful gift is designed to be easy to pack up and put away, rarely seen in children’s dollhouses which makes it pleasing for the whole family. Lakeshore Build-It-Yourself Woodworking Kit – This is another wonderful building kit with simple but more detailed construction. With 80 pieces in all an instructions for multiple projects you and your child can work on building toys together that have a simple, clean design. What I enjoy most about these pieces are the lack of plastics or branding, keeping your child’s toys free from branding messaging allows their imagination to soar. Djeco puzzles: Paris, Abracadabra, Poetic Boat – Puzzles are a simple and classic family pastime, with 100 pieces these beautiful and heavily illustrated puzzles allow your child to explore each piece and the puzzle as a whole. Each puzzle offers a different scene with many visual elements displayed throughout. 3-D puzzles: Taj Mahal, The Colosseum – These are fun puzzles with a twist. Include an added element of challenge with 3-D interlocking puzzles. Many of these puzzles come are historical pieces of architecture or from moments in history like The Titanic. Beautifully constructed, these puzzles can be displayed afterwards as a collectible item for your child that allows them to engage and discover history through architecture in a unique way. 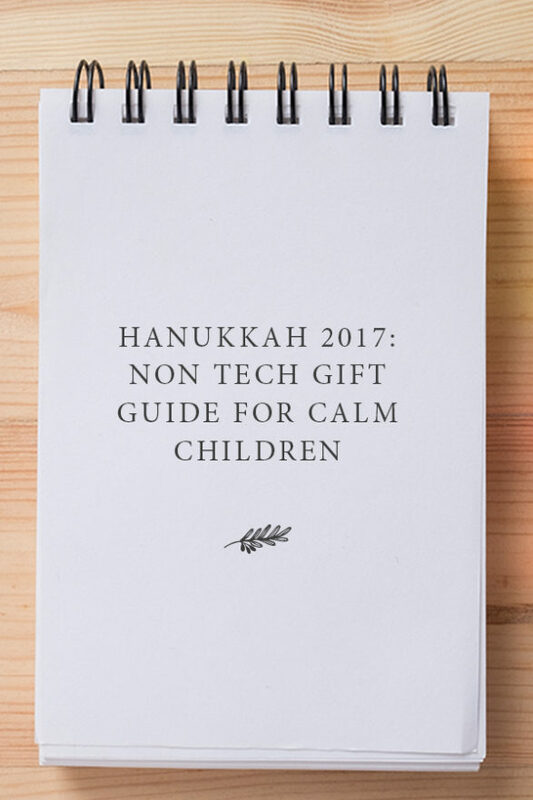 Your Turn: Do you have a non tech Hanukkah gift you love to give? Share yours with us here!